The Estill Course was far and away the most in depth, revealing, educational and inspiring vocal study I have ever done in my 20 years of singing. Jenny’s teaching was so clear and her delivery of the knowledge, though dense, was broken down to be incredibly digestible. I found the methods, techniques and information to be a revelation: it made me emotional at times, to think of the vocal relief and improvements I can now make for my singing and my vocal health, a career-long struggle for me. Thank you Jenny and thank you Jo Estill! Highly recommended and I intend to go much deeper into the wonderful world of Estill. Next “How Does My Voice Work?” will be in HOBART, on May 4th, 2019. 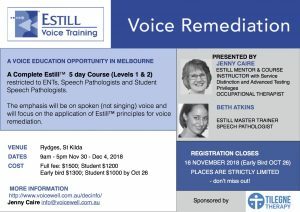 Estill Levels 1 & 2 specifically and exclusively for ENTs, Speech Pathologists and Speech Pathology Students. If you are interested in this course click here. Next Crash-Hot Choristers! is in HOBART, TASMANIA! Saturday, May 4, 2019, 2 – 5pm. Cost $80. This course is exactly what I’ve been looking for! It’s turned my idea of what I can do on its head and blasted open so many possibilities and new understandings. The scientific explanations were placed in a practical context every step of the way. 2-day Intensive Workshop including a review of Level 1 Figures for Voice, and ideal for those wishing to work towards a Certificate of Figure Proficiency. Jenny is available for one-to-one lessons in vocal technique, remediation for injured or strained voices, or for anyone who would like to improve their singing. Anyone can sing – you just need to learn how to do it!